More blue water is to be found on the sixth floor of Bluewater Keyes where a second pool deck is located. A pair of hot tubs and a kiddie pool are on this rooftop sun deck for you to enjoy during your North Myrtle Beach vacation. Both of these sun decks and the white sandy beaches are perfect for the guests of Bluewater Keyes. The convenience, the fun and the quality time are right here and will go a long way in making your North Myrtle Beach vacation at this North Myrtle Beach resort one to remember for years to come. The North Myrtle Beach condominiums at Bluewater Keyes have two or three bedrooms. The two-bedroom, two-bath condos in North Myrtle Beach, SC sleep six people. 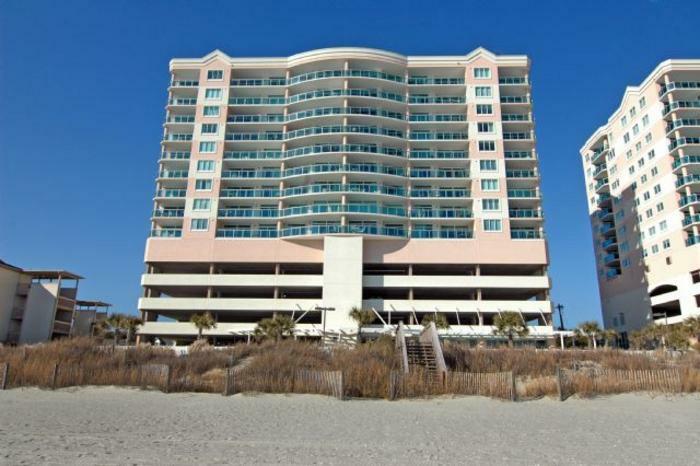 The three-bedroom, three-bath North Myrtle Beach condos accommodate 10 or 12 people comfortably. Each of these North Myrtle Beach rentals features an ocean view balcony. The sunlight streams in and invites you to go out to the balcony for coastal breezes and the sound of crashing waves. The glass railing on these ocean view balconies allow for unobstructed views of the water and North Myrtle Beach landscape during your beach vacation. These deluxe North Myrtle Beach condos also boast a fully furnished kitchen, high-speed Internet access, washing machine, clothes dryer and at least one DVD player. These North Myrtle Beach rentals are full of amenities and conveniences and your family will be more than comfortable spending a North Myrtle Beach vacation here. Take full advantage of the Jacuzzi tub that is found in each of these North Myrtle Beach condominium rentals. What a relaxing way to settle down after spending the day on a championship golf course, shopping or playing hard at the nearby amusement park. Tile floors, fine furnishings, plush linens and a soothing color palette lend to the memorable experiences your family will have in these nicely decorated condominiums in North Myrtle Beach, South Carolina. The fitness room at Bluewater Keyes has views of the Atlantic Ocean. It is just on the other side of the glass wall near the pool deck. The Bluewater Keyes fitness center features cardio machines and strength training equipment. Take a few minutes each day and get in a quick work out to help offset the divine cuisine and extra calories you are likely to pick up while dining on delicious North Myrtle Beach seafood during your beach vacation. Bluewater Keyes is a beautifully maintained North Myrtle Beach resort with gorgeous and welcoming North Myrtle Beach condominium and penthouse rentals and two pool decks. The white sandy beach that stretches out in front of this oceanfront North Myrtle Beach resort is fantastic. Your family can easily spend all day digging in the sand and building tall sand castles or burying one another in the sand. Just offshore you can often see commercial fishing boats, recreational boats and the occasional dolphin. The inflated parachute that you see being pulled by a speed boat is a parasail ride and during your North Myrtle Beach vacation you can go tandem parasailing for some awesome views! Banana boat rides, Sea Doo rentals, dolphin watch cruises and fishing charters are among the nearby activities in North Myrtle Beach, South Carolina. North Myrtle Beach shopping is diverse. It includes quaint shops along Main Street with beach-themed décor, antique stores with those one-of-a-kind treasures, outlet malls with your favorite brand news on sale and beachwear stores where you can pick up postcards, beach chairs, salt water taffy and Myrtle Beach souvenirs. Barefoot Landing, Broadway at the Beach and Market Common are popular shopping destinations that also feature theatres and restaurants.